Florence Nightingale wrote 'Notes on Nursing' for caregivers in the home and it is remarkable how much of the original remains relevant today. This modern edition aims to complement the work of Florence Nightingale, extending her reach to new generations committed to caring for the people they love. The International Council of Nurses and the Florence Nightingale International Foundation (FNIF) have prepared this modern edition of the Notes 150 years after its original publication, to mark FNIF’s 75th anniversary. 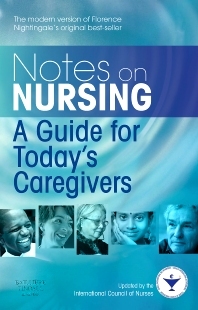 Practical advice on what a caregiver needs to do and know in order to deliver the best care to loved ones, including how to organise the home environment, preparing and serving food, bedding and preventive measures against infection and other complications which put loved ones at risk..
Clear guidance, with illustrations, lists and planning tools to help caregivers organize and provide an effective program of care. Advice for caregivers on how to work with nurses, physicians and other health professionals to ensure their prescriptions and advice are well understood and implemented. Advice which anticipates and addresses the needs of all caregivers, whether they live in a modern community or in remote regions with less access to safe water, medications and health professionals.